Oxyd Review 2019: Is Oxyd a Good Hosting? 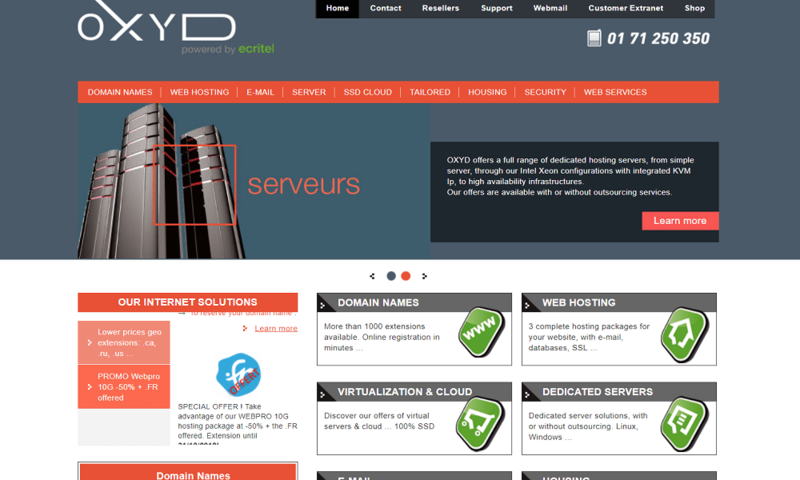 Paris-based Oxyd provides just about any type of internet hosting services you require - from website hosting to email hosting to cloud server solutions. They also provide fully managed server services if you need a hands-off solution. OXYD was founded as a French company in December of 2000 with the goal of providing highly affordable web hosting solutions to as large an audience as possible. As such, they provide a wide range of internet hosting-based services that include different types of website and server hosting as well as related services, such as domain registration, email, etc. They proudly boast that 80% of their employees are technical support staff to give their customers the level of support they require. As of now, they are still based in Paris and offer their services primarily in French. Managed server: For an extra fee, you will have a 24/7/365 dedicated manager overseeing the health and availability of your server. Website creator: Although slightly dated, their website creator tool is very easy to use and comes with templates and a wide selection of modules. With their option to purchase extra support services, the process of managing your hosting solution can be as hands-on or as easy as you want it to be. They also make use of Plesk as a management console, which is one of the easier to use and more popular hosting managers. Oxyd’s pricing plans are divided into three main categories which are Standard web hosting, Dedicated server hosting, and Virtual server cloud hosting. Each of these has packages that differ in the amount of resources they provide. WEBPRO 5G: 5GB storage, 100 emails, 5 GB email storage. WEBPRO 10G: 10 GB storage, 200 emails, 10 GB email storage. WEBPRO 25G: 25 GB storage, 300 emails, 25 GB email storage. OPTIMA STAR 2018: 1 Xeon processor (4 cores), 24 GB RAM, 480 GB SSD, 4 TB SATA disk. OPTIMA STAR 2018: 2 Xeon processors (4 cores), 96 RAM, 1 TB SSD, 4 TB SATA disk. Virtual Cloud Servers: The configurations for their cloud hosting solutions are very similar to those of the dedicated servers. There are three set plans as well as the option to apply for a custom solution. All products come with both ticket and phone support. In addition, you can add on support services for an extra monthly cost to your dedicated or cloud hosting product in the form of a dedicated hosting manager that will look after your solution. However, support is mainly offered in French and you stand little chance of getting great service in another language. If you require simple web hosting, then Oxyd provides a good range of offers as it’s very affordable but doesn’t come with any extraordinary features. For those based in France, they provide amazing support as well as managed hosting services for your dedicated or virtual cloud servers. Wondering how Oxyd stacks up against other Web Hosting companies? Enter any other Web Hosting company and we will give you a side-by-side comparison.